SUPER SMASH BROS ULTIMATE. NINTENDO SWITCH. (:) We will always find a great solution for you. We are closed over the weekend. We can't send to APO.and PO BOXES unless you have it in your personal information on the sites. Super Smash Bros. (Nintendo 3DS, 2014). Condition is Like New. Shipped with USPS First Class Package. N64 Super Smash Bros. (Nintendo 64, 1999). Condition is Like New. Shipped with USPS First Class Package. 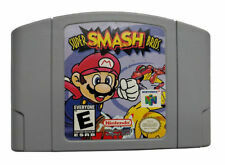 Super Smash Bros. for the Nintendo 64, REPRODUCTION Game Cartridge Only. Cartridge is in good condition. Good luck, please check out my other auctions. Super Smash Bros. (Nintendo Wii U, 2014). Condition is Like New. Shipped with USPS First Class Package. Super Smash Bros. (Nintendo 64, 1999). Condition is Good. Shipped with USPS First Class Package. 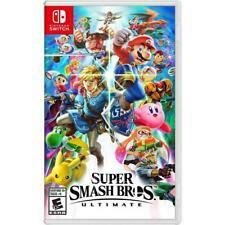 Super Smash Bros Ultimate Special Edition - Sealed, Great Condition Packaging. Condition is Brand New. Shipped with USPS Priority Mail. Thanks for shopping! Nintendo 64 Super Smash Bros. Game Used. Condition is Very Good. Shipped with USPS First Class Package. Super Smash Bros. (Nintendo 3DS, 2014). Condition is Very Good. Shipped with USPS First Class Package. Lightly used adult owned copy. Includes everything in photo and works perfect. Thanks! 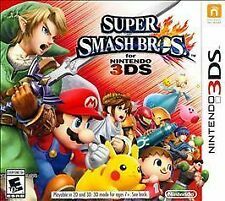 Super Smash Bros. (Nintendo 3DS, 2014) Cartridge Only. Condition is Very Good. Super Smash Bros. (Nintendo 64, 1999) retro video game. Condition is Good. Shipped with USPS First Class Package. Complete Boxed Nintendo 64 Game Super Smash Bros. Authentic N64 W/ Box. Condition is good, works as should. Box is a little worn, see pics for details. This game is a classic and super fun. I’m having my first child and going through a phase of selling everything. Keep an eye out for more games, consoles and anything 90’s. I have 100% positive feedback and I plan on keeping it that way. I will mail item out next day USPS free shipping! Please don’t ever hesitate to ask any questions, thank you and have a blessed day. Switch Super Smash Bros. Ultimate NEW. Hold a 4-player free-for-all or kick it up to 8-player battles. Compatible with Nintendo Switch only. You are bidding on the case and manual for the classic SUPER SMASH BROS 3DS. Everything is in great shape! 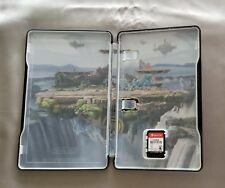 Again, CASE and MANUAL ONLY, NO GAME.Check out my other items. Thanks! (Super Smash Bros ). US/CAN Version, Language: English. Super Smash Bros. (Nintendo 3DS, 2014). Condition is Very Good. Comes with game AND case with manual. Ships USPS ASAP after receiving payment. Ships to All 48 contiguous states only. If any questions contact seller. Super Smash Bros. If not paid for by the 7th, the item will be relisted. Once again, the picture displayed is of the actual item you will receive - nothing more, nothing less. Super Smash Bros. (Nintendo 3DS, 2014). Condition is Very Good. Shipped with USPS First Class Package. 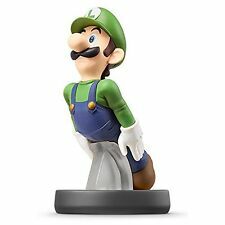 This Amiibo is in good working condition. It is in nice cosmetic condition. Team up with your amiibo or play against friends in the Super Smash Bros. for Wii U game Customize your amiibo by adjusting their offensive and defensive capabilities Build your amiibo to level 50 so that you can crush even the toughest opponents Tap amiibo to the Wii U GamePad controller and watch your characters come to life in different games in all sorts of exciting ways Additional amiibo characters and compatible games are coming soon. These are not in original packaging and there is a small hole in the base, but it does not affect the performance. A felt pad is on the Amiibo base as well. It is guaranteed to work perfectly. Super Smash Bros. (Nintendo 64, 1999) cartridge only. Condition is Good. Shipped with USPS First Class Package. Super Smash Bros. (Nintendo 64, 1999) N64 Player’s Choice. Condition is Very Good. Tested with an authentic N64 and is working. Pictures are of actual auction item. 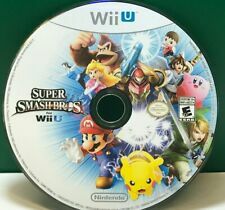 Up for sale is my reproduction copy of Super Smash Bros. Condition is Like New. , 26.3 mm tall (about 1 in. )., and 6.5 mm thick (about. 25 in.). 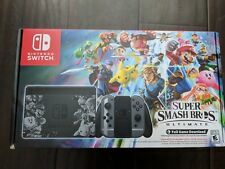 Wii U Super Smash Bros Bundle MINT! RARE! 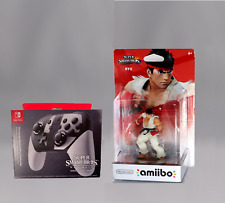 This is the complete Super Smash Bros Wii U bundle in MINT condition. It was used ONCE! The box is a teensy bit frayed at the corners but otherwise in great condition too. Super Smash Bros. (Nintendo 64, 1999) Cleaned / Tested / Authentic - N64 -. Condition is Very Good. Shipped with USPS First Class Package. All tested and working. Include in this lot is a rare limited edition preview disc of star wars rebel strike, isn’t in the best condition but works. 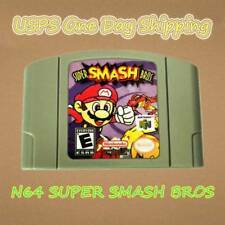 OEM Super Smash Bros Nintendo 64 N64 Authentic Video Game Players Choice GOOD!